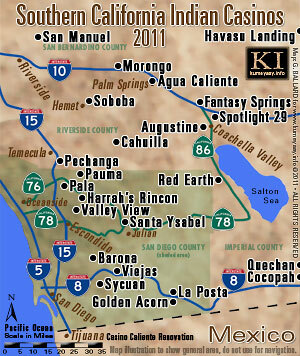 The Kumeyaay Information Village Website provides this KUMEYAAY INDIANS on-line research portal and educational tutorial free of advertisements and agendas to learn about the southwestern aboriginal California tribal peoples of San Diego County and Imperial County and northwest Baja California — the Kumeyaay Nation, aka Kumeyaay-Diegueño Nation — their ancient indigenous culture and Yuman language family of Hokan linguistics through a virtual tour of historic facts and information about Kumeyaay Indian history, storytelling, ethnographic arts and crafts, artifacts, tribal rancherias and anthropology of the "Kumeyaay Indians" of Southern California, including the Diegueno California Indians' historical and modern struggles for survival and cultural identity into the 21st Century. 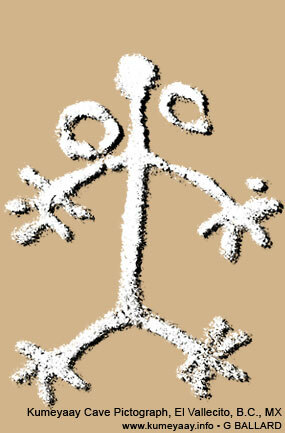 (Submit your opinions, photos to Kumeyaay Information Village Website for publication). The sovereign KUMEYAAY-DIEGUENO NATION of indigenous Native American California Indians of North America are known by many names and spellings, including: Kumiai, Ko'al, Kumei, Cumeyaay, Kumyai, northern and southern Diegueño Diegueno Digueño Digueno Dieguenyo, Ipai-Tipai, Tipaay, Tiipay-Iipay, Diegueno-Kamia, Kamia, Mission Indians of San Diego California Mission Indians, San Diego Indians. The oldest known Kumeyaay ancestors -- the San Dieguito Paleo Indians -- have been traced back into prehistoric San Diego lands to 10,000 B.C. 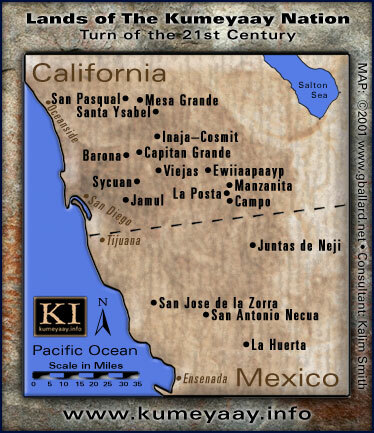 through hard archeological evidence collected from ancient San Diego area indigenous sites which virtually proves the Diegueno and Kumeyaay Indian peoples have lived in Southern California and northwest Mexico for at least 12,000 years. KUMEYAAY 12,000-YEAR HISTORY in San Diego — since 10,000 B.C. — an editorial perspective, timeline and history essay about San Diego's original people. Indigenous Kumeyaay-Diegueno Tribes of California Online Museums Research features free movie theater, Native American films, video, beautiful color high-resolution professional pictures of Native faces, photos, picts, pics, images and digital restorations of historic Kumeyaay-Diegueno-Ipai photographs about the Kumeyaay Indians, Kumeyaay bird dances. Creative media includes HISTORICAL and Kumeyaay RESERVATION MAPS, KUMEYAAY HISTORY and KUMEYAAY OPINION essays editorials, Kumeyaay approved book list and useful facts information about the tribal Native Californians of the greater San Diego County area. UNITED STATES Southern California Kumeyaay bands, the so-called Mission Indians, Diegueño Indians include the 13 federally-recognized Kumeyaay tribes in San Diego County. Links and information to the sovereign Kumeyaay Indian reservations in San Diego County and the official web sites of the sovereign KUMEYAAY-DIEGUENO NATION. KUMEYAAY.INFO has no affiliation with KUMEYAAY.COM. The sovereign KUMEYAAY-DIEGUENO NATION is a branch of the YUMAN INDIANS of North America, Southern California, southwest Arizona, and northern Baja California, Mexico. The KUMEYAAY INDIANS are of the Hokan stock of indigenous North American languages that were spoken on the West Coast and southwest United States of America, and in northwestern Mexico (Baja California and Sonora). KUMEYAAY GAMING DEPARTMENT offers a free directory index listings to the top 10 Native American gaming tribes, including the best Kumeyaay casinos in San Diego County and the history of tribal gaming in America. KUMEYAAY.INFO offers fully restored and captioned old antique vintage historical Kumeyaay pictures of museum quality, and editorial forward in our KUMEYAAY HISTORY overview. "The resistance of the Kumeyaay was seen as overwhelming to the Spanish at times. In 1779, Lt. Colonel Fages summed up the Kumeyaay attitudes as follows, "Indeed this tribe, which among those discovered is the most numerous, is also the most restless, stubborn, haughty, warlike, and hostile toward us, absolutely opposed to all rational subjection and full of the spirit of independence." "This ethnographic overview focuses on the Kumeyaay of southern San Diego County. It is based upon the detailed descriptions and research findings of several important ethnohistorical and ethnographic studies. Includes Subsistence, Housing & Technology, Settlements & the Seasonal Round, Kumeyaay Agriculture, Social Organization, Trade, Spiritual Life." Iipay Tiipay, Ipai Tipai, Hokan, Yuman, Nyakipa, San Dieguito Paleo Indians, Southern Diegueno Diegueño Dieguenyo, Diegueño Diegueno Kamia, Mission Indians, San Diego County, Imperial County, Baja Norte, Rancho San Diego, Mission of San Diego de Alcala by Father Junipero Serra 1769, Missions of California, Mexican-American War, Treaty of Guadalupe Hidalgo 1848, shiimull, kwaaypaays, kuseyaay, Kuchumaa, Kuuchamaa, Bird Song, Bird Singing, Bird Dance, Bird Dancing, Eagle Dance, Eagle Dancing, The Mission Period 1769-1822, The Mexican Period 1822-1848, The 1848 Treaty of Guadalupe Hidalgo, Larry Banegas www.kumeyaay.com, Samuel Brown www.kumeyaay.org, Mike Connolly Miskwish, Dr. Florence C. Shipek, Florence Shipek, Rupert Costo, “The Missions of California: A Legacy of Genocide”. Note: The above SEARCH links are pre worded, all you need do is click on the links. The Search Engine Optimization SRO experts the Editor talked to seem to prefer the GOOGLE engine because it has the most "natural" results (not influenced by placement fees). HERE is Glenn Welker LINKs page kumeyaay.info for indigenous research on global Indigenous issues. Here at the Kumeyaay Information Village Website and Resource Links Center, San Diego County, Imperial County, Orange County, Los Angeles County, City of El Cajon, Alpine, California, we have researched the internet for the very best relevant Ipai Tipai, Yuman, Diegueño information, Kumeyaay indigenous knowledge available on the web, the Kumeyaay history, Kumeyaay culture, and we have designed a modern, dynamic, easy-to-use graphical interface to make surfing the web easy and fun by hyper linking you and your classrooms students to the very best Kumeyaay Indians experts, the very best Kumeyaay web sites, and the very best Kumeyaay creative resources on the web.